He had come up from the Lake District and over the Carter’s Bar, that great ridge of high ground that divides England from Scotland, on whose broad back the ancient courts and markets of the Borders had been held. 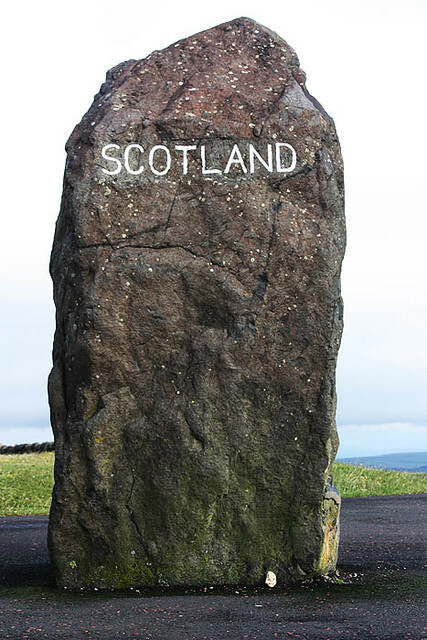 “There’s a stone there to mark the border, maybe you’ll know; it looks the sort of stone to last a while.” He glanced at me, questioning, and I nodded. I did know it; a huge menhir, some ten feet tall. 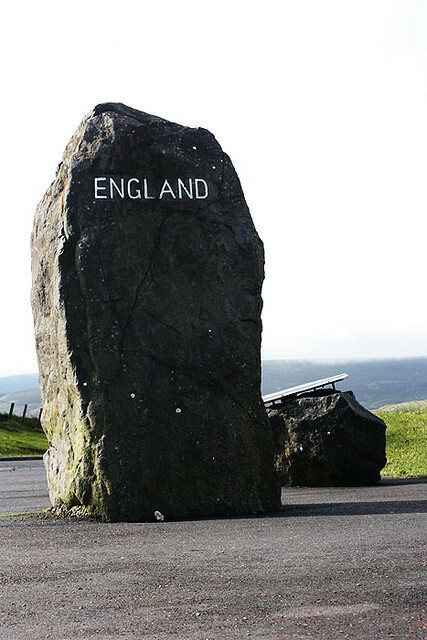 In my time, someone had carved on its one face ENGLAND, and on the other, SCOTLAND. There he stopped to rest, as thousands of travelers had stopped over the years, his exiled past behind him, the future--and home--below and beyond, past the hazy green hollows of the Lowlands, up into the gray crags of the Highlands, hidden by fog. 2) I saw this branding iron in the shape of an "M" at the North Carolina Museum of History in Raleigh, NC, in 2011. (A fascinating museum, by the way, and highly recommended!) It was labeled as being from the 19th century, but it caught my attention because it looks just like the one that was used to brand Bobby Higgins for his role in the Boston Massacre. The "M" is very small, maybe the size of my thumb nail. Certainly big enough for people to notice it, though! Jamie did his best in the office of ambassador, but the effect of Bobby’s brand proved insuperable. While admitting that Bobby was a nice young man, Mr. Wemyss was unable to countenance the notion of marrying his daughter to a murderer, no matter what the circumstances that had led to his conviction. "Folk would take against him, sir, ye ken that fine," he said, shaking his head in response to Jamie’s arguments. "They dinna stop to ask the why and wherefore, if a man’s condemned. His eye--he did nothing, I am sure, to provoke such a savage attack. How could I expose my dear Elizabeth to the possibility of such reprisals? Even if she should escape herself, what of her fate--and that of her children--if he is knocked over in the street one day?" He wrung his hands at the thought. "And if he should one day lose his Lordship’s patronage, he could not look for decent employment elsewhere, not with yon mark of shame upon his face. They would be beggared. I have been left in such straits myself, sir--and would not for the world risk my daughter’s sharing such a fate again." The scientific name means "finger-like" and refers to the ease with which a flower of Digitalis purpurea can be fitted over a human fingertip. 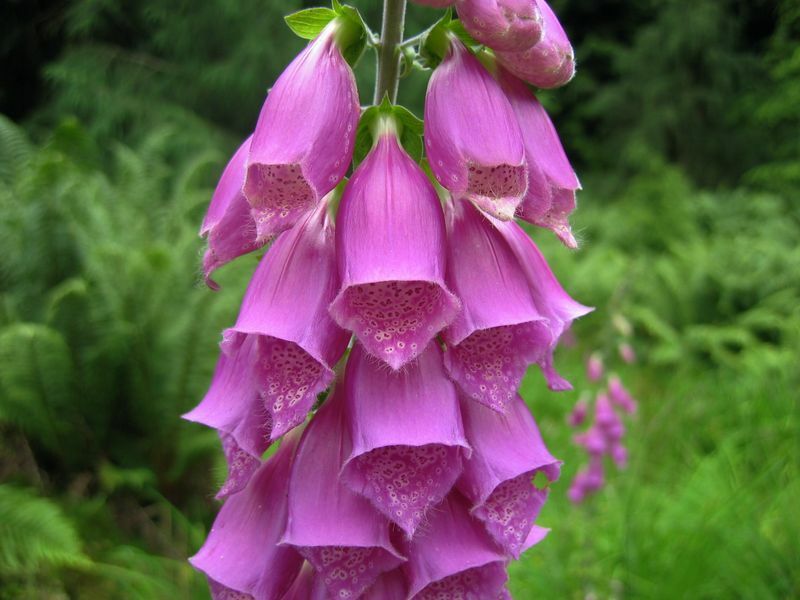 The entire foxglove plant is toxic, including its roots and seeds, but its medicinal benefits have been known for centuries. The use of D. purpurea extract containing cardiac glycosides for the treatment of heart conditions was first described in the English-speaking medical literature by William Withering, in 1785....It is used to increase cardiac contractility...and as an antiarrhythmic agent to control the heart rate, particularly in the irregular (and often fast) atrial fibrillation. Digitalis is hence often prescribed for patients in atrial fibrillation, especially if they have been diagnosed with congestive heart failure. Claire treated Alex Randall with digitalis in DRAGONFLY IN AMBER, when he was dying of consumption. I couldn’t bear the look of his chest, heaving under its impossible burden, and I gently closed his shirt and fastened the tie at the neck. One long, white hand grasped mine. "How long?" he said. His tone was light, almost unconcerned, displaying no more than a mild curiosity. “I don’t know,” I said. “That’s the truth. I don’t know." "But not long," he said, with certainty. "No. Not long. Months perhaps, but almost surely less than a year." I reached for my kit. "Yes. I can help it, at least. And the heart palpitations; I can make you a digitalin extract that will help." I found the small packet of dried foxglove leaves; it would take a little time to brew them. “Sixième!” Clifford said, his voice full of joy. Grey smiled, despite the loss of points, gave the proper reply of “Not good,” meaning his own hand could not beat that, and put Percy firmly out of mind. Harry had suggested that Grey and Hal might leave after the first game, but Grey was entirely aware that Harry knew this wouldn’t happen. Hal was a cutthroat cardplayer, and once his blood was up, there was no dragging him away from the table. As picquet was a game for two hands, obviously Grey couldn’t leave until Hal did, or the numbers would be unbalanced. They therefore played in pairs, changing partners after each game, the two men with the highest scores to play the final game. Grey did his best to put everything out of his mind but the play. Here are the rules of piquet, in case you want to try it yourself. Piquet is game for two players, using a shortened pack of 32 cards which omits 2 to 6 in each suit. In ascending order, the cards rank 7, 8, 9, 10, J, Q, K, A (high). A number of French terms are traditionally used for various features of the game. Piquet is a very old game. It was well established by 1650 with similar rules to the present ones....It has retained its popularity to the present day as one of the best and most skilful card games for two players. 5) The photo above, from Wikipedia, shows an American bison (also known as a buffalo). What's the difference between a buffalo and a bison? Look here. The one that visited Fraser's Ridge in THE FIERY CROSS was apparently a bison, although I don't suppose any of the characters in the story knew that. <g> And even today, many people use the terms buffalo and bison interchangeably. Now imagine what Claire and Bree and Marsali must have felt, seeing one of these enormous beasts heading straight for 18-month-old Jemmy, tethered by his leading strings to a paddock fence. Marsali let out another screech, and Jemmy, catching her terror, began to scream for his mother. I turned, and--feeling as though I were moving in slow motion, though I was surely not--snatched the saw neatly from Jamie’s hand, went out the door, and headed for the yard, thinking as I did so that buffalo looked so much smaller in zoos. For more information about bison, look here. I like this little video, because you can hear what they sound like. They are indeed bison, and the one Claire and Bree met was a wood bison. However, the folk who lived in the colonies at that time did call them buffalo. Hi Karen - I was listening on Saturday to the part in Voyager when Jamie describes his return to Lallybroch and was thinking about the large stone at Carter's Pass, wondering how big it really was and what it looked like and low and behold, there is it. Thanks, it is always so helpful having visuals to go with our imaginations. I was in Scotland 32 years ago on my honeymoon, but don't remember seeing Carter's Pass. Did you see it when you were in Scotland?